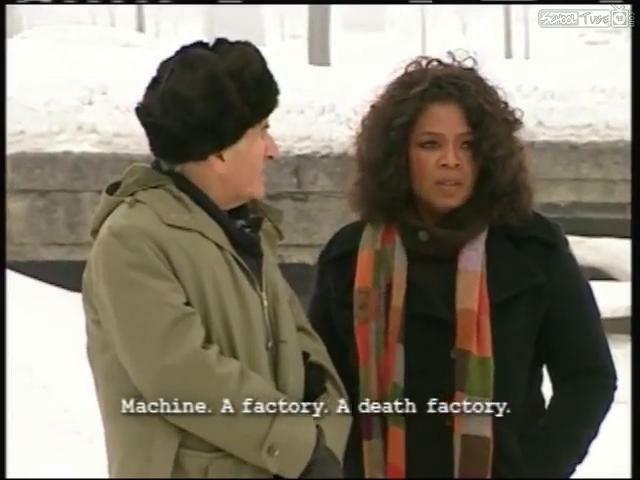 Elie and Oprah star in a very boring film about … walking around in the snow. Here they are in front of the Auschwitz 1 crematorium, feeling the horror. In Auschwitz, Germans have been accused of making soap from Jewish corpses, but it takes a Jew to make a soap-opera there. Professional victim Elie Wiesel and professional victim enabler Oprah Winfrey made a soap opera at Auschwitz on January 29, 2006, exactly ten years ago. The two superstars, along with Winfrey’s film crew, met in front of the entrance to Birkenau and much of that filming was added to the documentary created later in-studio by Oprah’s production team. The resulting 45-minute “movie” was broadcast as part of The Oprah Winfrey Show in May of that year. It remains online and is shocking in its use of crude lies about Auschwitz taken from Elie Wiesel’s book Night and the worst of old wartime propaganda. Recall it was thirteen days earlier on Jan. 16 that Winfrey announced the “new 2006 translation” of Elie Wiesel’s Night as her newest book club selection. 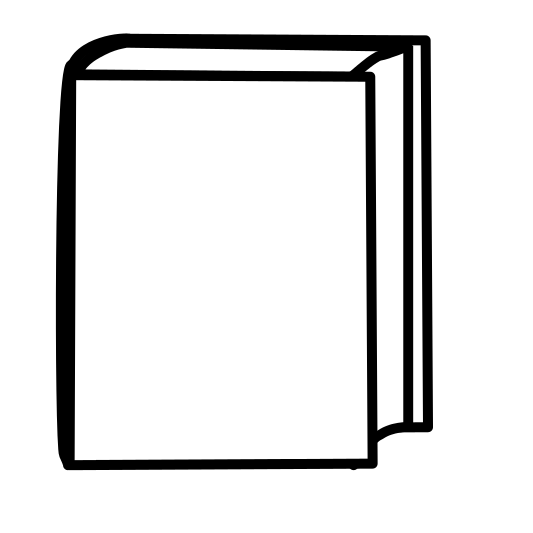 The next day, Jan. 17, Amazon announced it was changing the category of Night from novel to memoir. A lot of questions were raised (as it was known they would be), and the Elie-Oprah Auschwitz trip was intended to help distract attention away from those embarrassing questions … to reinforce to the public that Wiesel was a genuine, suffering “death camp” survivor and Night was unquestionably his true story. It was, in my opinion, a business venture that the advisers to both parties worked out as part of the entire deal between Oprah and Elie. All the two headliners had to do was show up and act out the roles they knew so well. Oprah has referred to Wiesel as “my world hero” and said she was never the same after reading Night; she was the perfect gullible, unquestioning foil for him. It was assumed by Oprah and the manipulated public that Wiesel would be her guide to a place he knew well. (And it would have been a perfect time for him to show his tattoo to the camera … if he had one.) But as I will point out, Elie’s words, or lack of them, expose him as a stranger to that place. He tells fiction after fiction, taken from lurid survivor testimonies that were discredited long ago. The only things he really describes are his emotions, his feelings, his thoughts … which become boring and are not convincing either. On the 3rd and last time he came, he made the film with Oprah, which is titled “Auschwitz Death Camp.” The lies and just plain ignorance that are packed into this program is amazing. I will refute some of it here. Elie actually says very little in the beginning but reads passages from Night in order to not speak such stupidities on camera. It is understood by most reasonably sophisticated people that Night is a creative effort—not to be taken literally. Notice that in the film he doesn’t describe his life in the camp with any detail–no names, specific persons, places, events—only generalizations anyone could come up with. For instance, standing in front of Block 17 in Auschwitz 1, where he says he lived, he claims he thinks often about those who died there, but doesn’t offer a single name or how they died. Oprah takes in every word from the “Professor” (as she calls him) as profound, and though she responds in her trademark super-sympathetic manner, it does seem that she would have liked something more solid from him. She seemed to me to find her hero’s wandering, empty thoughts unsettling – and was pretty much left speechless. This has to be why her production team added so many background film clips and photos portraying the usual media version of the holocaust story—to add some content to a boring walk in the snow with an old con man. Sorry, but if you pay close attention, you should come to the same conclusion. I link to the pages on Oprah.com that I am commenting on, and highlight the offending passages in boldface, so that you can follow and compare. There was no stench of burning flesh in the air at Birkenau, in spite of quite a number of “survivor novels” that say so. Operating crematoria do not release any smell. Wiesel picked up that idea of “stench” from the testimonies at the Nuremberg tribunal and Soviet reports. In 1955 he thought it was safe to say such things. Today we know what he wrote did not happen. The systematic process of determining who would live and who would die was known as “selection.” SS officers briefly sized up each new arrival. Those deemed capable of hard labor, like 15-year-old Elie Wiesel and his father, went into the work camp. All others were sent immediately and unknowingly down the path to Auschwitz’s four gas chambers. The “selection” was for work placement, not life or death. Those who could not work (children, elderly and sick) went into the barracks at Birkenau where they were fed and allowed to join in activities. There was actually a lot going on. Mail was delivered in both directions, packages were received, the health clinics and hospitals were busy. Some did light work in the camp. Even babies were born. No one went to a gas chamber because there were none. Wiesel never, ever spoke of a gas chamber in his book Night, written in 1954, and further edited from 1956-58. He only spoke of people taken to the crematorium after they died, which to him at that time was only from disease, hard work and mistreatment—not gas chambers! Those selected to die were told they were getting showers, then packed into the chambers by the thousands. Canisters of the deadly chemical Zyklon B were dropped in. As the toxic pellets mixed with air, cyanide gas was released. Death took about 15 minutes to come and felt like suffocation. Proud of their efficiency, SS officers witnessed the gassing as it happened through special peepholes. None of this is true. Shower facilities were real showers, an important part of the camp disease prevention program. “Canisters of Zyklon B were dropped in”? What would canisters do? Does Oprah expect that the ‘victims’ opened the canisters themselves? Death from Zyklon B poisoning would not feel like suffocation. Death by poison gas is painless; one just drifts into unconsciousness. Claiming that SS officers watched people die through peepholes is the lowest form of defamation of Germans—one thing that Wiesel specializes in. He is pawning off this gruesome “camp gossip” to Oprah and she is not questioning it. But later in the video she did keep saying she “couldn’t understand” how human beings could do such things. The answer is they didn’t. The grisly task of burning the dead bodies in underground ovens was left to Jewish prisoners. Forced into this horrific job, they temporarily evaded their own death. It doesn’t say much for Jews if they agreed to kill and cremate their own people just to put off their own death for a short time. There is no way to force someone to do this, either. This is one of the weakest links in the Jewish Holocaust narrative. Professor Wiesel takes Oprah inside one of the few barracks still standing at Auschwitz. He says that prisoners were packed two or more to a bunk on straw mattresses. Professor Wiesel slept on similar bunks at Auschwitz and later at Buchenwald. Wiesel never wrote of sleeping two (or more) to a bunk. He wrote that at times he was on the top bunk and his father on the bottom. In Buchenwald there was never two to a mattress, especially in the children’s barrack. Most people don’t find straw mattresses unpleasant to sleep on, especially if they’re tired enough, but most of the people living in Birkenau actually didn’t do much in the way of work and exercise. 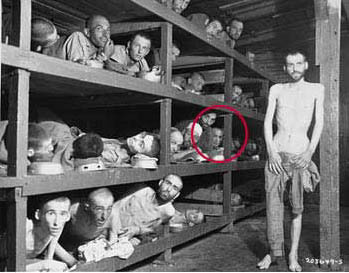 “Elie Wiesel looks out from the far right of the middle bunk.” This photo was staged in an empty barrack because the mattresses have already been removed, 5 days after liberation. In this photo, taken by soldiers on April 16, 1945, after the liberation of Buchenwald, Elie Wiesel looks out from the far right of the middle bunk. That is not Elie Wiesel in the photo. That person looks nothing like him, but also he writes in his various memoirs that he became seriously ill with food poisoning two days after the April 11th liberation and was taken to a hospital where he stayed for two weeks. Think how ludicrous it is that he should claim to be in both places at the same time! This should tell you something about Wiesel’s irresponsibility when it comes to the holocaust narrative. Anything goes. Rats, lice and other vermin were rampant. Deadly outbreaks of dysentery, typhus, tuberculosis and malaria wiped out entire sections of this camp. Inmates wore thin cotton uniforms year round, even in the harshest winter. Given only meager rations of stale bread and meatless soup, many starved to death. For prisoners not sentenced to die in the gas chambers, the average life span was barely four months. Complete nonsense. The barracks at Birkenau were cleaned and disinfected regularly. Wiesel even writes about it in Night. There are photographs of outdoor workers wearing heavy coats, boots, caps and gloves in winter. NO ONE STARVED TO DEATH. The emaciated inmates at the end of the war were afflicted with wasting diseases, not starvation. That the life span was 4 months is an invention picked up by Elie Wiesel from other “survivor stories.” Why then are there millions who were in the camps for several years and are now still getting a reparation check every month? For saying these kinds of irresponsible things, Wiesel should be reprimanded by the Auschwitz-Birkenau Memorial staff, but he isn’t. At Auschwitz 1, the notorious Dr. Josef Mengele, known as the Angel of Death, conducted sadistic medical experiments on prisoners, infecting them with diseases, rubbing chemicals into their skin and performing crude sterilization experiments in his quest to eliminate the Jewish race by any means possible. 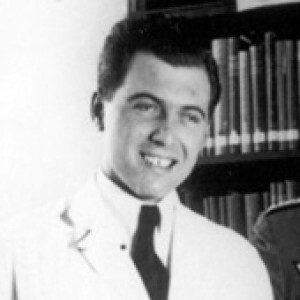 Joseph Mengele was a normal man who served humanity as a doctor. All the stories about Mengele are inventions. True, he was interested in gaining knowledge about certain medical conditions but not in the way the crazy, narcissistic Jews talk about it. He was actually a goodhearted man who has been made into a devil. Elie Wiesel never laid eyes on him anyway. In Block 11, the secret German police, the Gestapo, interrogated and tortured political prisoners and anyone who dared to disobey. The Gestapo had an office at Auschwitz. There was a good deal of sabotage and contact with the enemy carried out by Auschwitz 1, 2 and 3 inmates, especially the Poles who had a strong network with Warsaw and London. This could not be allowed and was punished severely. But the Gestapo didn’t regularly “torture political prisoners” or those who “dared to disobey.” That is more camp gossip. Good police know how to gather evidence and get confessions without torturing people. Block 11 was simply the camp jail and it has has been built up into a torture chamber, which it wasn’t. What’s he talking about? Nothing, it’s Wiesel-speak. We can’t know what he means by “torture” since everything is a torture for him. But he pushes the theme that death was preferable to life in the camps—at the same time he describes how he and everyone else clung to life. He preaches that the camps were places of continual punishment, which isn’t the reality at all. If it were, how would so many millions have come out at the end of the war in good health? A case filled with empty Zyklon B cans is a haunting reminder of the poisonous gas used by the Nazis for killing prisoners on a massive scale. “When the gas chambers were full, an SS man put on the gas mask, went to the roof, opened the little window there and threw such a can into the gas chamber,” Professor Wiesel explains. “Unspeakable pain and horror—that’s how they were killed. Mothers and children hugging. Once again, the claim of mass killing is false. Prisoners were kept as healthy as possible in order to be able to work. And also once again, they’re throwing “cans” into the “gas chamber” through a little window in the roof. Pretty stupid of the SS men! Also – once again – death by Zykon gas is painless. “Mothers and children hugging” is pure soap opera fiction to effect the emotions of school kids and women like Oprah. 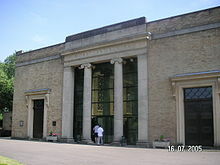 It has been shown conclusively that there never were any homicidal gas chambers. It was black ops propaganda and is now just a plain old Big Lie. Baby clothes and shoes are all that remain of the death camp’s smallest victims. Infants were killed immediately on arrival, as were the young mothers who refused to leave their children. No evidence for that at all. A few items of baby clothes is sure not evidence. The evidence shows that children were provided with kindergartens at Birkenau with painted murals on the wall. Babies were born at the hospital at Auschwitz. I could go on and on. Wiesel is on overdrive to make Nazis guilty of unspeakable crimes … the better to extort billions from Germany for Israel. The Nazis went to sinister lengths to profit from the extermination of millions, and no possible resource was wasted. Human hair shorn from victims’ scalps was gathered and sold to German factories to make cloth. Human hair was cut short to control body lice that the Jews and others brought with them to the camp–not to make a profit. They no doubt couldn’t have profited, considering all the barbers that were necessary. It was a life-saving measure. What was done with the hair after it was cut was of no importance to the inmates. Do you want to keep the hair that is cut from your head? Do you worry that the salon or barber shop will make a profit from it? I doubt it. Wiesel tries to connect cutting of hair with extermination, but there is no connection. Failing that, he projects it as a humiliation. Wiesel wants you to believe that the “Nazis” made money off the Jews’ bodies by selling their hair, when in fact they were just making use of all resources in their wartime economy. Is it better to throw stuff away, or to recycle it? We could ask why Elie didn’t take Oprah to see the swimming pool. Or take her into one of the large kitchens, or the theatre. Or point out where the soccer field had been in Birkenau. Apart from the fact that he may not even know about these places, since he never lived there, both knew that bringing up that aspect of the camps would defeat the purpose and soapiness of their soap opera. Their purpose was to reinforce the stature of Elie Wiesel and his book Night, and a secondary benefit was to give Oprah more tear-jerking content for her TV show. In May 2011 Night was #3 on the Top Ten bestseller list from the Oprah Book Clubs in their final 10 years, according to Nielsen BookScan. Winfrey did her best as an actress even though she broke character in a couple places, haltingly expressing her confusion about the story, saying she couldn’t make any sense of it. Wiesel immediately counseled her that she should not look for sense because none could be made of it. It is unexplainable and inexplicable … and a permanent mystery. As for upholding his part in making the film interesting, Wiesel totally failed. He was a bore. His Auschwitz experience remains preposterous and unconvincing—really just a soap opera.